What we choose to eat inevitably affects how much water we use. The plants we grow for crops and the animals we raise for food need a lot of water. Since croplands and pasture together cover almost all of the viable land on earth, we indirectly consume a tremendous amount of freshwater. In fact, about 90 percent of the freshwater we consume from the world’s rivers, lakes, and groundwater is used up to grow crops or raise animals. On average, there’s plenty of water to meet all of our needs, but considering water use on average isn’t very helpful. We only need water in certain places, and it is heavy and expensive to transport. On about a third of the world’s cropland area, crops don’t get as much water as they need. People experience water scarcity through food scarcity–850 million people worldwide are hungry or malnourished, and insufficient water to grow crops is one reason for this. In this report, we focus on irrigation water, the water for agriculture that people control directly. Irrigated agriculture is important: roughly 24 percent of the world’s croplands are irrigated, but they produce 30-40 percent of the world’s crop calories. One big challenge to food system sustainability is to manage irrigation better to produce food in places where water is scarce. Agriculture accounts for about 80 percent of global water consumption. That is 246 km3 per year. For example, if this water were poured over the whole country of Greece, it would rise above the height of a 6 foot-tall person. In contrast, if the 24 km3 we consume in our homes each year–including drinking water, cooking, bathing, washing, and watering our lawns–was poured across Greece, the water would rise to just above our ankles. We typically eat 500 times more water than we drink. 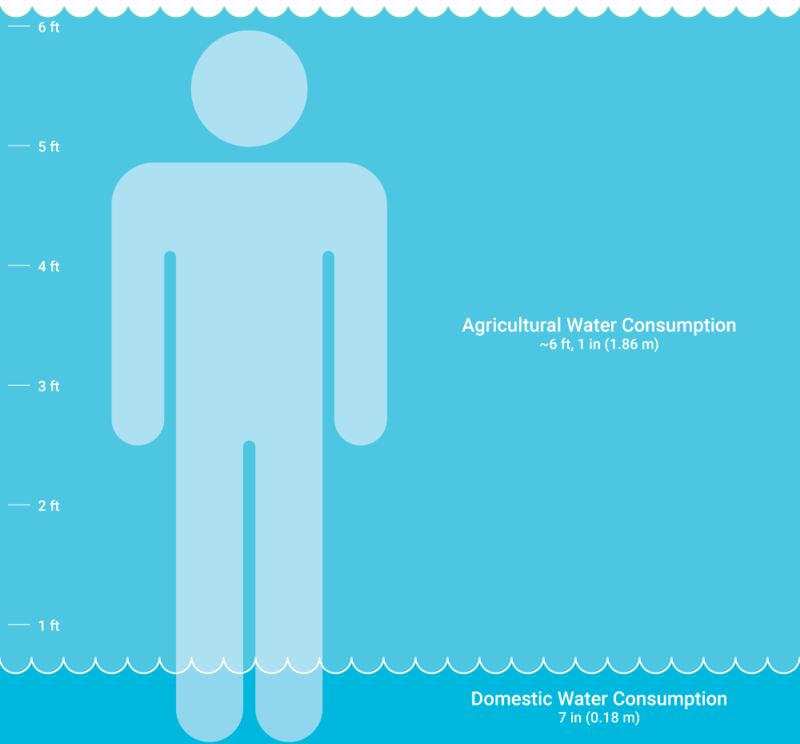 In most areas of the world, what we eat is the largest part of our water footprint. Compared to the water consumed to produce a serving of food, a typical 8 ounce glass of water that we drink is trivial. Different kinds of food vary greatly in the amount of water consumed from farm to fork, but meats (especially livestock with long life cycles) consume much more water per serving. In addition, some foods, like coffee, consume a lot of rainwater, but not nearly as much irrigation water. At the same time, the amount of irrigation water consumed to produce a particular food depends greatly on where its grown. For example, a cow living in California typically eats hay watered with irrigation water, while a cow living in Wisconsin might subsist almost fully on rainfed grass. Agriculture will inevitably use much more water than any other human use. That’s because most water doesn’t stay in plants. When it rains, roughly 70 percent of the water evaporates or is absorbed by crops or other local vegetation. About 30 percent of the water moves across or through the soil as runoff, where it might flow into rivers and reservoirs that contribute to the water supply that we can control. Croplands use a similar amount of water as our natural forests or grasslands do. In a given place, if there is more rain than crops need, crops will grow and the excess will run off, the amount of water use may not affect crop growth or overall water consumption. However, when there is less rain than crops need, using water to irrigate crops can make an important difference. Eighty percent of the world’s croplands depend fully on rainfall and need no irrigation water. In fact, rainfed agriculture is the world’s largest user of water and supplies 60-70 percent of the world’s food calories. But the remaining twenty percent of cropland depend on at least some irrigation water. To understand how to save more water, then, we need to look at where irrigation matters most for water stress. The yield for irrigated cereals is much greater than yields on croplands fed only by rain. While about 24 percent of the world’s croplands are irrigated, croplands receiving irrigation when needed tend to be much more productive than croplands that are only rainfed. This is to be expected—as irrigation brings crops closer to optimum growing conditions, crops grow more intensively. For example, the average global yield for irrigated cereals is roughly 60% greater than for cereals grown on rainfed croplands (2.66 tons ha-1 for rainfed, 4.42 tons ha-1 for irrigated). However, when judged by irrigation water consumed per unit of food, irrigated lands are not all equal. Some irrigated areas receive little annual rainfall, and crops depend on irrigation water for a high proportion of their overall need. In most irrigated areas, though, croplands receive a small but consistent supplement of water, and this additional amount allows much higher yields. Similarly, some irrigated areas require seasonal irrigation to maintain crops during periodic dry spells. Another way to understand the importance of irrigation for food production is ask what would happen if the world stopped irrigating altogether. 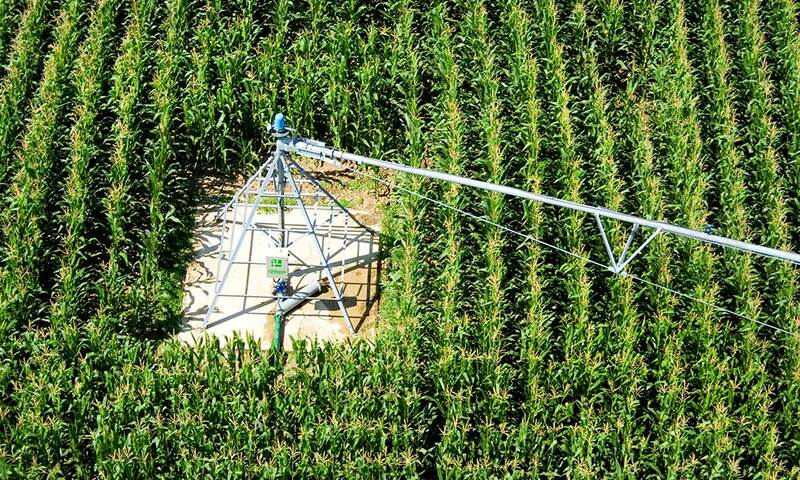 One key study finds that without irrigation, global crop yields would decrease by about 20 percent. Since irrigation is a supplement to rainfall in most places, we’d still continue to produce on those lands, but globally we’d be about half as productive. 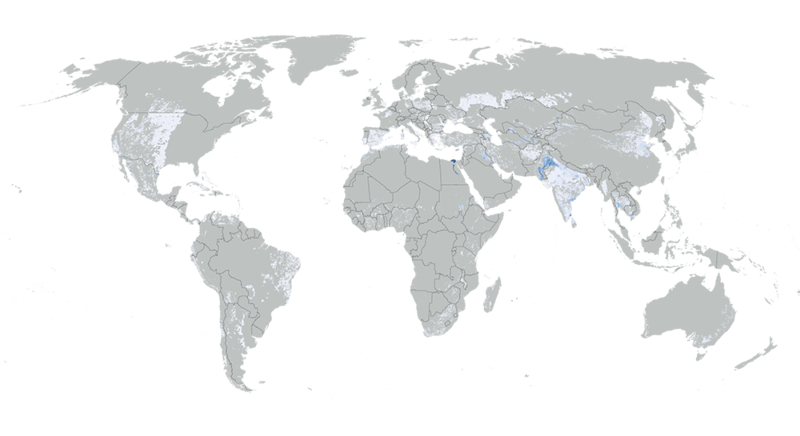 Irrigated areas are concentrated in just a few major areas of the world. This includes much of the cereal producing regions of Asia, much of the central and western parts of the US, the west coast of South America and in southern Brazil, northern Africa, and much of southern Europe. We don’t go to the trouble of watering crops unless they need it. As a result, most of the world’s irrigated cropland area is where you’d expect it to be—where precipitation is less than water demand. This means that most irrigation happens in arid or semi-arid areas around the world. However, the consequences of agricultural water use vary considerably depending on the place. 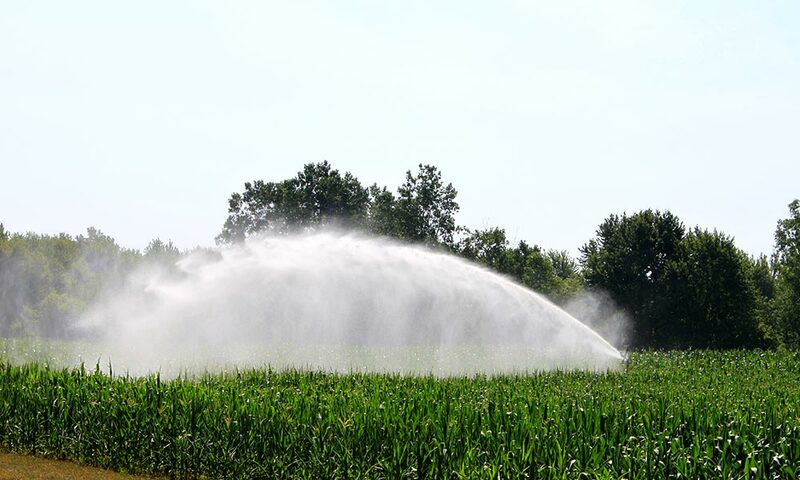 By using water from rivers, lakes, or groundwater to grow crops, irrigation imposes tradeoffs. By diverting water from these sources, it means we can’t use it for something else. Irrigation can be used to move water around in time or over distance. For example, small reservoirs in Sub-Saharan Africa store heavy rains that fall during the wet season for irrigation use later in the year. On the other hand, the Central Arizona Project transports water throughout the year from the Colorado River to an area of Arizona that is almost always water-limited. Rice paddy in Yuanyang, China. 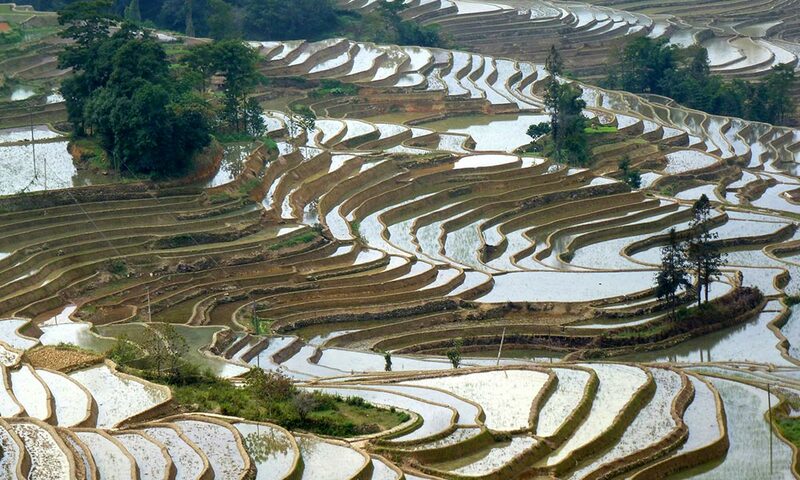 To irrigate their crop, farmers channel water down step-like terraces. Photo by Yulin Jia / BMC Ecology. Sprinkler irrigation in Superior Township, Michigan. The sprinkler waters this corn field in a way that mimics natural rainfall. Photo by Dwight Burdette. Center pivot irrigation in southwest France. The equipment rotates around a standstill center, watering crops in a surrounding circle. Photo from Wikimedia. 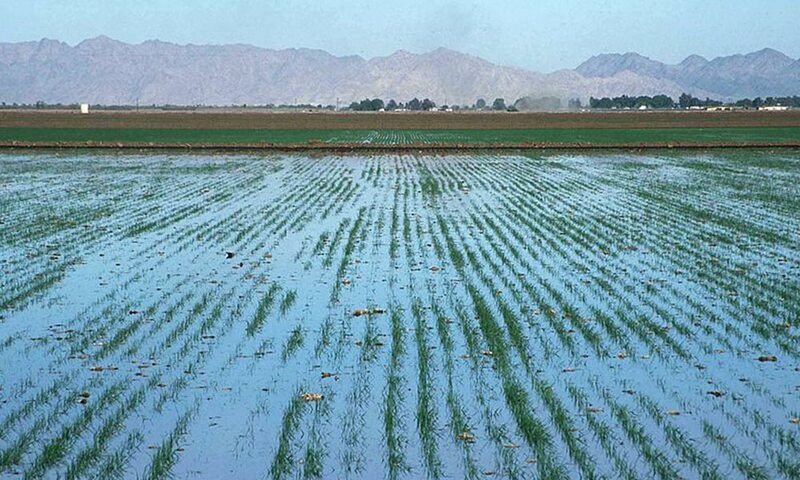 Flood irrigation in Yuma, Arizona. An ancient yet still-popular way to water crops, flood irrigation is usually inefficient. Photo by USDA. 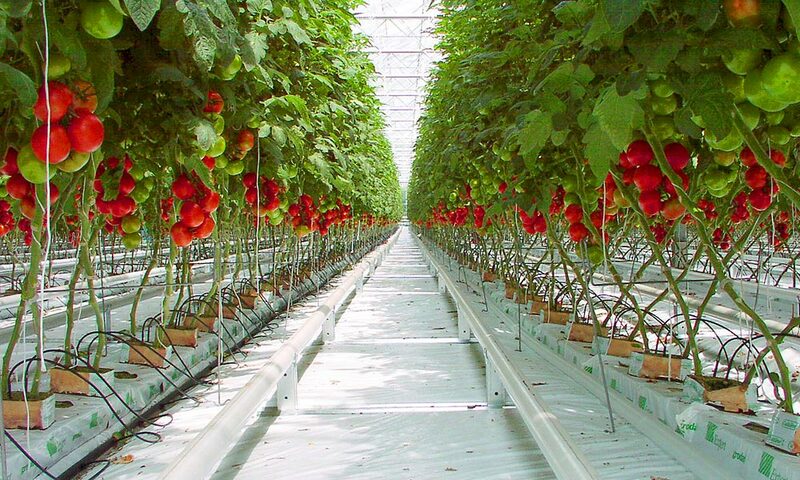 Drip irrigation in a German greenhouse. This method is by no means restricted to the indoors—many fields use drip irrigation, too. Photo from Wikimedia. 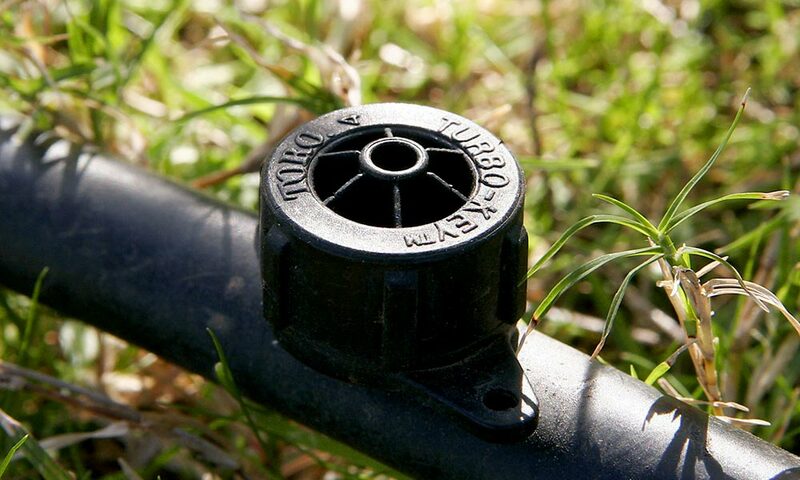 Close up of an irrigation dripper. 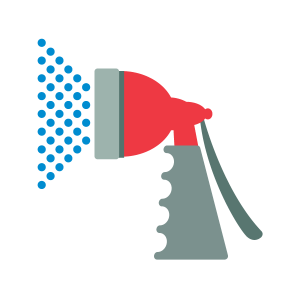 After traveling through tubes, water slowly drips out of the head, which is called an emitter. Photo by Fir0002/Flagstaffotos. Just five crops account for about two-thirds of irrigation water consumption. Considering the world’s top production crops, rice and wheat cover almost two thirds of irrigated area, and account for 45 percent of global irrigation water consumption. 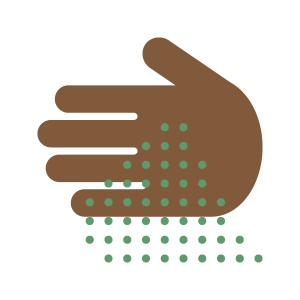 Three other crops—cotton, maize, and sugarcane—consume an additional 20 percent of total irrigation water. Along with managed grasslands, these few crops account for about 74 percent of irrigation water consumption. Crops that are most dependent on irrigation water include date palms (85 percent of total crop water use was from irrigation), cotton (39 percent), citrus fruits (33 percent) and sugar beets (32 percent). In contrast, cassava, oil palm, and cocoa use almost no irrigation water. The security of our food system and the sustainability of our freshwater use are inseparable. Efforts should focus first on areas of the world that use the most water and grow less crops. In water-limited areas, if we raised the efficiency (measured as kilocalories produced per liter of water consumed) to the 20th percentile, water consumption would be reduced by 8-15 percent in regions of Africa, Asia, Europe, and South America. Of course, improving the value of our water first depends on what we want to receive. Is the goal to increase calories produced for water consumed? This report has focused largely on this metric, and the result means that we need to focus on how to grow staple crops (like cereals) better. Is the goal is to increase tons of food per litre of water? In that case, shifting to crops with high water content (like sugarcane) is warranted. If instead we want maximize the monetary return for water consumed, shifting to high value crops, like coffee and almonds, may achieve this goal. Agricultural water can be used more effectively by either reducing the consumption of irrigation water directly, or growing more crops for each liter of water we consume. The good news is that, especially when water productivity is low, appropriate solutions may require little additional water. In addition, effective solutions depend ultimately on the type of crop and the place it’s being grown. Globally, there is also tremendous opportunity to reduce the irrigation water we demand through the foods we eat. Cutting the amount of animal protein in our diets in half would decrease global water consumption by 6 percent (for rainwater), and 4 percent (for irrigation water). 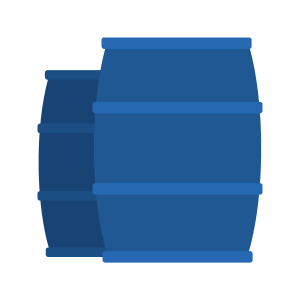 These techniques capture and store rainwater to be used later when water is scarce. In Los Angeles, water reservoirs are covered in millions of “shade balls,” an innovative and cheap way to curb evaporative losses. Deficit irrigation can reduce water consumption by crops–for example, with wine grapes to reduce water consumption and improve fruit quality. Drip irrigation can help reduce water loss from canals, and it is particularly useful for reducing evaporative losses from the space between fruit trees. For nutrient-limited soils, addressing deficiencies with nitrogen and phosphorus fertilizer or agroecological methods improve soil nutrient conditions, boosting yields. Modified tillage practices, including terracing or furrowing, reduce evapotranspiration of water in soils, as well as wind-driven erosion. Credits: Kate Brauman, Barrett Colombo, Peder Engstrom, Andrew Urevig, Paul West. Design: smashLAB. Brauman, Kate A., Stefan Siebert, and Jonathan A. Foley. “Improvements in Crop Water Productivity Increase Water Sustainability and Food Security—a Global Analysis.” Environmental Research Letters2 (2013): 024030. Print. 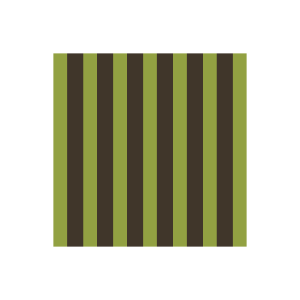 “Center for Environmental Systems Research: WaterGAP.” N.p., n.d. Web. 26 Oct. 2015. Döll, Petra, and Stefan Siebert. “Global Modeling of Irrigation Water Requirements.” Water Resources Research4 (2002): 8–1–8–10. Print. Gleick, Peter H. “Global Freshwater Resources: Soft-Path Solutions for the 21st Century.” Science5650 (2003): 1524–1528. Print. Gleick, Peter H., and Newsha Ajami. The World’s Water Volume 8: The Biennial Report on Freshwater Resources. Vol. 8. Island Press, 2014. Print. 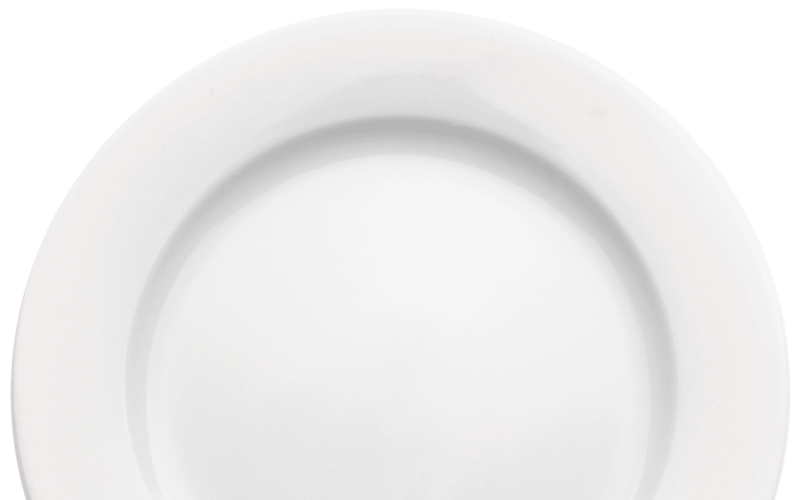 “Http://www.choosemyplate.gov.” Choose MyPlate. N.p., n.d. Web. 26 Oct. 2015. Jalava, M. et al. “Diet Change—a Solution to Reduce Water Use?” Environmental Research Letters7 (2014): 074016. Print. Mekonnen, Mesfin M., and Arjen Y. Hoekstra. “A Global Assessment of the Water Footprint of Farm Animal Products.” Ecosystems3 (2012): 401–415. Print. —. “The Green, Blue and Grey Water Footprint of Crops and Derived Crop Products.” (2010): n. pag. Print. Molden, David et al. “Improving Agricultural Water Productivity: Between Optimism and Caution.” Agricultural Water Management4 (2010): 528–535. Print. Nutrient Data Laboratory, Beltsville Human Nutrition Research Center. “NDL/FNIC Food Composition Database Home Page.” N.p., Dec. 2011. Web. 26 Oct. 2015. Perry, Chris. “Accounting for Water Use: Terminology and Implications for Saving Water and Increasing Production.” Agricultural Water Management12 (2011): 1840–1846. Print. —. “Efficient Irrigation; Inefficient Communication; Flawed Recommendations.” Irrigation and drainage4 (2007): 367–378. Print. Portmann, Felix T., Stefan Siebert, and Petra Döll. “MIRCA2000—Global Monthly Irrigated and Rainfed Crop Areas around the Year 2000: A New High‐resolution Data Set for Agricultural and Hydrological Modeling.” Global Biogeochemical Cycles1 (2010): n. pag. Print. Postel, Sandra L., Gretchen C. Daily, and Paul R. Ehrlich. “Human Appropriation of Renewable Fresh Water.” Science-AAAS-Weekly Paper Edition5250 (1996): 785–787. Print. Rockström, Johan, and Jennie Barron. “Water Productivity in Rainfed Systems: Overview of Challenges and Analysis of Opportunities in Water Scarcity Prone Savannahs.” Irrigation Science3 (2007): 299–311. Print. Siebert, Stefan, Matti Kummu, et al. “A Global Dataset of the Extent of Irrigated Land from 1900 to 2005.” Hydrology and Earth System Sciences Discussions12 (2014): 13207–13258. Print. Siebert, Stefan, Jacob Burke, et al. “Groundwater Use for Irrigation–a Global Inventory.” Hydrology and Earth System Sciences10 (2010): 1863–1880. Print. Siebert, Stefan, and Petra Döll. “Quantifying Blue and Green Virtual Water Contents in Global Crop Production as Well as Potential Production Losses without Irrigation.” Journal of Hydrology3 (2010): 198–217. Print. West, Paul C. et al. “Leverage Points for Improving Global Food Security and the Environment.” Science6194 (2014): 325–328. Print. Wichelns, Dennis. “Do Estimates of Water Productivity Enhance Understanding of Farm-Level Water Management?” Water 6.4 (2014): 778–795. Print.